I have condoned it in Bender, unfortunately only an empty card. The secret key, no idea where to enter it. I'm afraid there's the fault somewhere. Ik heb het gecondoleerd in Bender, helaas ook alleen een lege kaart. De geheime sleutel, geen idee waar die ingevuld moet worden. Ik ben bang dat daar ergens de fout zit. Sorry, I have no idea from your description what could be wrong on your side. I have checked the plugin, and it is working. Again, secret key is not used, you don't need it for plugin. I suggest you install a fresh Osclass and test it again, preferably on new domain and server. Then it would be the second time that I start again. Lost all members and ads. Will think about this, maybe I'll stop right away. Dan zou het de tweede keer zijn dat ik opnieuw begin. Alle leden en advertenties kwijt. Zal hier over denken, misschien stop ik wel helemaal. I have tried again, is really on OpenStreetMap Maps. Is blocked because it is http. Show blockade unsafe script and see the result. 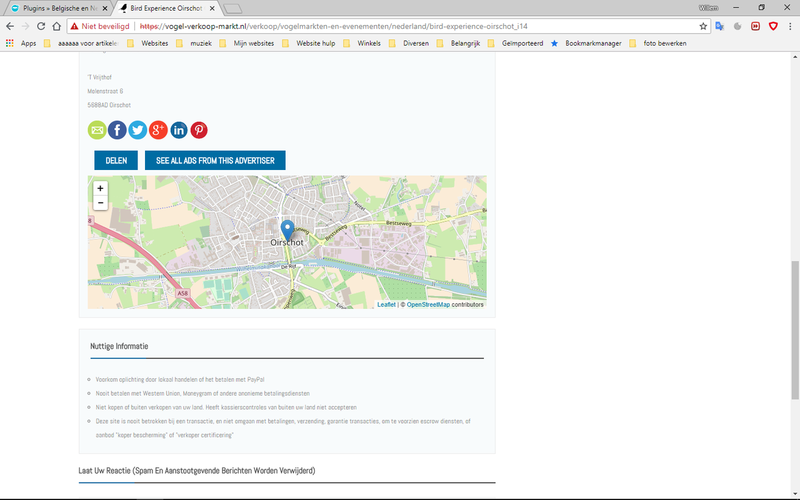 Ik heb het opnieuw geprobeerd, ligt echt aan OpenStreetMap Maps. Wordt geblokkeerd omdat het http is. Blokkade onveilige script tonen en zie het resultaat. Replace your public API key in index.php file. This version also has a debug function to see what you get for a response directly on item page; you can use it as per README.md file instructions. I have tested it in localhost (without a real domain) and on plain http, it worked. Maybe their API detects localhost and white lists it, for dev / testing purposes, but if it's on a real domain, then it gets blocked. I don't really know, don't have much time to test all that now. Give it up to get this on my site. Heel veel dank voor uw hulp. Helaas lukt het nog niet. Geef het maar op om dit op mijn site te krijgen. I have been trying to get OSM working and my experiences seem to fit in with what I am hearing. So, consider me another data point. What I am looking for are tome debugging tips. First, let me say that the block for the map gets included in some themes but not in others. But, that's a different subject. I looked at the generated page source (that is, HTML with coordinates and such plugged into the JavaScropt) and it looked fine. So, I copied it, pasted in in a local HTML page and accessed it. The map displayed just fine. But, the page I grabbed the code from doesn't display it. The space is allocated but no map.